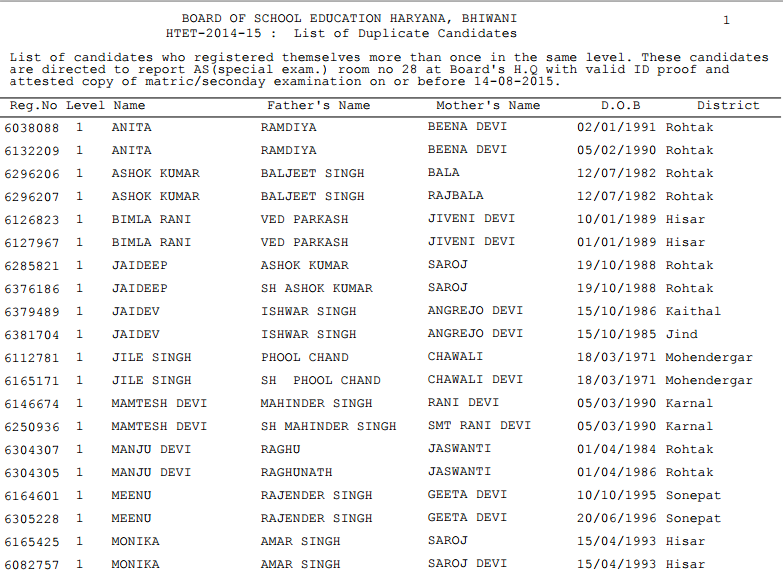 The Board of School Education Haryana (BSEH) issued List of candidates of such candidates who registered themselves more than once in the same level and candidates of Fee Defaulter of HTET 2015.Information with complete list of these candidates is available on official website of Board of School Education Haryana www.bseh.org.in.Board directed to all such candidates to report AS (special exam.) 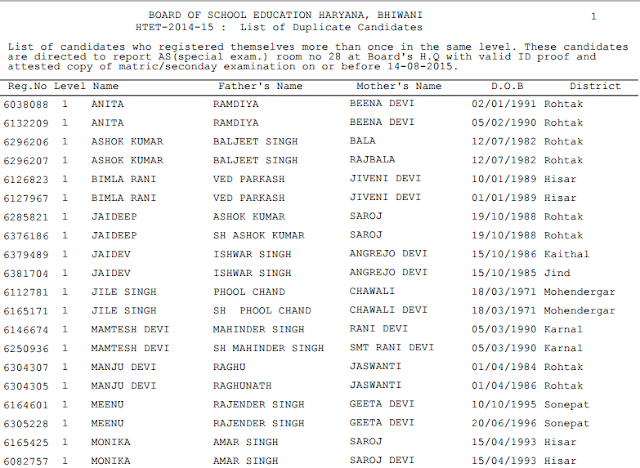 room no 28 at Board's H.Q with valid ID proof and attested copy of Matric/secondary examination/Special exam branch , along-with valid ID proof and copy of fee chalan on or before 14-08-2015.As per pre decided plan for HTET 2015 will be held on 30.08.2015 and 31.08.2015.This year the registration for HTET 2014-2015 started from 15.06.2015 at 11:30 AM on website www.htet.nic.in. For candidates of Computer Based Test (CBT) application fee for one paper was 600 rupees while for Pen Paper Based Test application fee was for each paper was 700/-. Date for correction in particulars-03.07.2015 to 05.07.2015. Date of Examination-31.08.2015 Saturday.Time of Exam- 11.00 AM to 01.30 PM. Date of Exam-30.08.2015 Sunday.Time of Exam- 10.30 AM to 01.00 PM. Date of Exam-30-08-2015 Sunday.Time of Exam-03.00 PM to 05.30 PM. Validity Period of HTET certificate-The Validity Period of HTET five years from the date of issue of qualifying certificate. Eligibility Certificate will be sent to all the eligible candidates by Speed Post/Registered Post. Use of eraser or white/correction fluid on the Answer Sheet will be not allowed.The examination hall will be opened 45 minutes before test. The Admit Cards will be uploaded on website before some days of examination. Tea, coffee, cold drinks or snacks are not allowed during examination hours. The candidates are required to use Blue or Black Point Pen to completely darken the appropriate circle.Government/Local authority.